Mosquito nets can provide an effective barrier against the blood-sucking insects that are so prevalent in some parts of the world. However, as with all tools, they have advantages and disadvantages. Nets can stop the insects from invading a user's personal space, but can also become damaged easily and may not prevent all bites. In the end, the use of a mosquito net while camping or in an otherwise open environment is a personal choice. When choosing a mosquito net, it is important to consider its function, where and how it will be used. 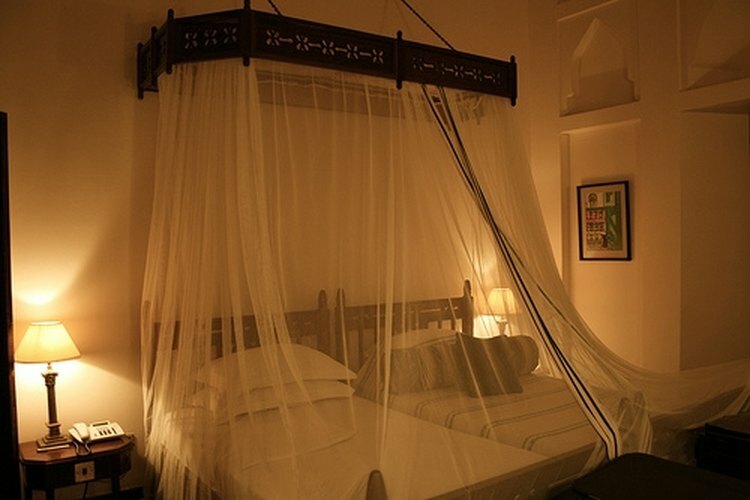 Some mosquito nets are made to connect to ceilings and walls. Others are self-supporting framed structures. A major advantage of a framed net is that it can be used anywhere. The disadvantage is that it creates more bulk. Another thing to consider is whether you would like a treated net or not. Mosquito nets are often treated with a chemical known as permethrin, which is fatal to the insects but is considered harmless to humans. While this may be a small advantage for some, if you do not like chemicals or have a reaction to them, it is best to keep away. The main job of a mosquito net is not to kill the mosquitoes, but rather simply provide a barrier to keep them away from you. Therefore, they can be an advantage in places where a tent is not sufficient or available, or a room has no screens and many open areas. However, they can also be a disadvantage when sleeping if you get too close to them. If you touch the screen, the mosquito will simply be able to land on it and bite you through it. Mosquito nets have been credited in some parts of the world as helping to cut down on mosquito-carried diseases. In addition, the nets take the place of dangerous chemicals that must be applied directly to skin and clothing to repel the insects. Some of these chemicals can make humans also feel uncomfortable. Mosquito nets also have the advantage of coming in different sizes. Some will be made to cover twin beds. Others will be made to cover beds as large as king size. If traveling with a net, it is always good to bring the largest one you think you will need. While it may add additional bulk, getting stuck with a net that is too small will do very little good. If traveling to places where mosquitoes are prevalent and you are staying in hotels, check to see if mosquito nets come standard in some rooms. Often, in certain locations, they will. This will help you avoid having to pack one, only to find there is one already provided. Only a few disadvantages to mosquito nets exist. If they become torn, they are hard to repair and can make a person vulnerable to mosquitoes. Also, while sleeping, it is easy to touch the sides and still wake up with a few bites. In addition, they will take up some extra space in your luggage.